Hello! 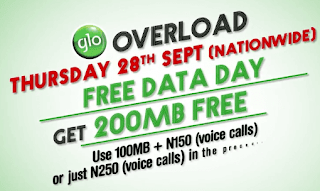 i am happy to inform you that Globacom Nigeria has declared Thursday September 28 A Free Data Day for all her new and existing subscribers. As mus as i know, this information will interest you. If you still have your Glo sim with you, kindly get it ready for the up-coming free data day. "You enjoy up to 200MB worth of data to browse your favorite websites, chat and stream videos, but customers need to meet set of voice and/or data usage threshold within 7 days to the free data day." Based on the above statement, it implies that Glo subscribers must meet up the above stated conditions in other to enjoy the free data. For you to be eligible for this offer, you must be able to meetup with the above conditions within 7 days before the promo set day. See how you get it. 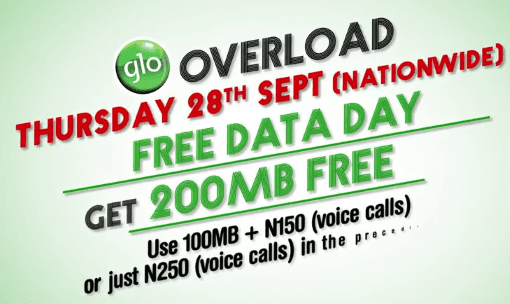 This is the only thing you need to do in other to be eligible for the Glo free data day. Remember the date once again is, Thursday 28th of September, 2017. Note: If you meet the above requirements, you will receive an SMS announcing your eligibility for the free data day.